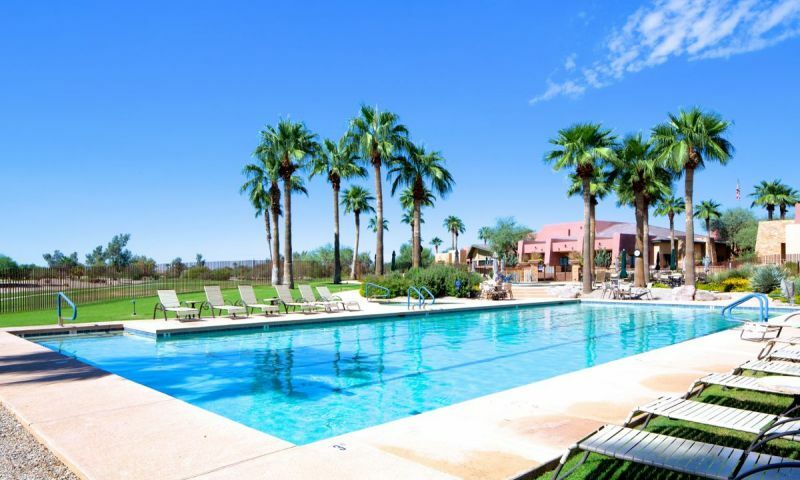 Solera in Chandler, Arizona is a Del Webb community 30 miles southeast of Phoenix. Set amidst the beautiful San Tan Mountains, homeowners in Solera enjoy magnificent views of the surrounding peaks. The community features luxurious single-family homes, world-class amenities and an 18-hole golf course.With just 1,149 homes, Solera is uniquely smaller than some of the larger Del Webb Sun City communities throughout the Phoenix valley. Solera was designed to provide residents with all the benefits of large-scale active adult living in a smaller, more intimate setting. Despite being smaller than the popular Sun City communities, Solera includes many of the sought after amenities demanded by today's active adult buyers. The clubhouse and amenity complex at Solera includes a state-of-the-art fitness center, two outdoor pools, hobby studios, ballroom, computer lab and library. Four tennis courts, two pickleball courts, two bocce ball courts and miles of walking and biking trails surround the clubhouse.The 18-hole Lone Tree Golf Club that winds through Solera is a semi-private traditional style course designed by Darryl Wilson. The course boasts meticulously manicured greens, lush fairways and reasonable green fees. It features a practice facility, fully stocked pro-shop and The Grille at Lone Tree restaurant. Homes in Solera were designed to meet the needs of active adult buyers who want low-maintenance ranch home living. Solera was constructed between 2001 and 2005. There are 10 single-family home models in Solera that range in size from 1,151 to 2,421 square feet. The developer has sold all new construction homes, but a variety of pre-owned resale homes are continually available. Many of the homes in Solera offer magnificent views of the golf course and surrounding mountains. Similar to all Del Webb communities, life at Solera is a never-ending lineup of fun activities, clubs, interest groups and exciting trips. A full-time activities coordinator helps residents create a physically and socially active lifestyle. Regardless of your passions in life, you are certain to find other residents in Solera who share your zest for living life to the fullest. Solera is located on the southern edge of Chandler where new home communities meet low desert and the San Tan foothills. The community is ideally situated within 15 miles of countless museums, theaters, casinos and golf courses. The Chandler Fashion Center Mall, which offers hundreds of brand name stores, boutiques and great restaurants, is 12 miles away. Phoenix and the surrounding area is easily accessible via the Santan Freeway five miles north or I-10 eight miles west of Solera. Lone Tree Golf Club is a public golf course that offers discounted rates to the residents of Solera. There are plenty of activities available in Solera. Here is a sample of some of the clubs, activities and classes offered here. The Holiday Series offers three single-family home floor plans. These homes range in size from 1,151 to 1,352 square feet in size with two bedrooms, two bathrooms, and an attached two-car garage. Solera's Tradition Series offers five floor plans that range from 1,516 to 1,895 square feet in size. These low-maintenance homes feature two to three bedrooms, two bathrooms, and attached garages. Many homes include dens that can be used as an extra bedroom or entertaining space. The Vista Series is the largest collection that was offered inside of Solera. These two models are 2,184 and 2,421 square feet with two or three bedrooms with two or three bathrooms. I have lived at Solera for about a year now and am just thrilled with all the people here. As a widow I wanted a quality built home in a community that felt really safe where the people were welcoming and friendly. I came to visit the community many times before making my final decision. The amenities are all very well done yet still feel warm and inviting. Everyone has encouraged me to get involved and I've made many new friends. 55places.com is not affiliated with the developer(s) or homeowners association of Solera. The information you submit is distributed to a 55places.com Partner Agent, who is a licensed real estate agent. The information regarding Solera has not been verified or approved by the developer or homeowners association. Please verify all information prior to purchasing. 55places.com is not responsible for any errors regarding the information displayed on this website.